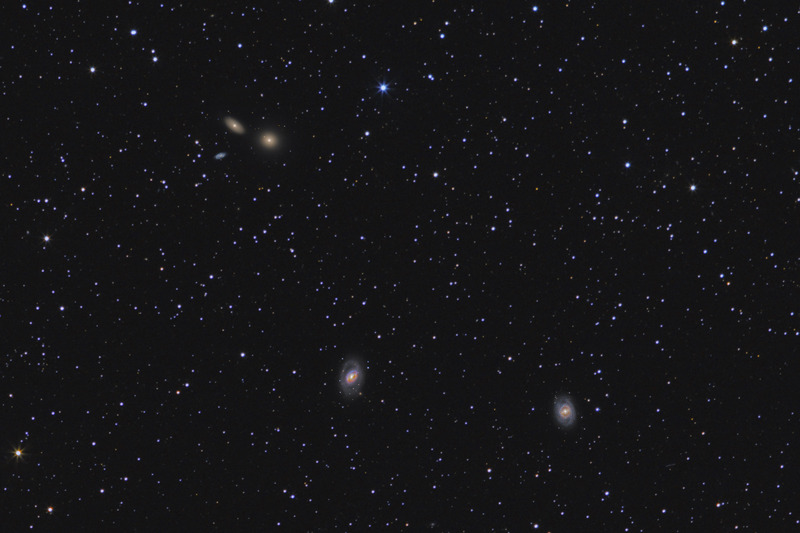 The M96 group of galaxies contains a number of bright galaxies and is a subgroup of the Leo I group of galaxies. The other subgroup in the Leo I group is the M66 subgroup which contains the famous Leo Triplet group of galaxies. In this image, M95 is the barred spiral galaxy in the lower right of the image. Clockwise from M95 is the group's barred spiral namesake, M96. 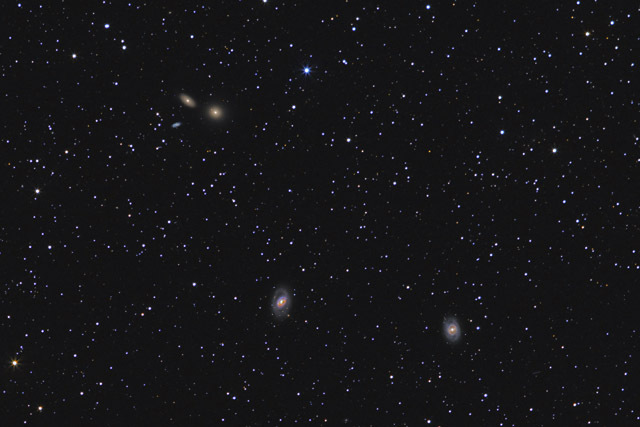 The galaxies in the upper left are NGC 3389 (spiral galaxy), NGC 3384 (lenticular galaxy at the top of the group), and M105 (large elliptical at right side of group). NGC 3389 is probably a background galaxy and not associated with the group, as its redshift is quite different from the Leo I group. Also scattered throughout this image showing approximately 2.5 degrees by 1.5 degrees of sky are a number of background galaxies and minor group members. This image is a composite of four different sets of data. The main image is made from 3 hours of data captured with a 200mm lens at f/3.5. This portion of the image was cropped to 39% of the original frame, and then upsampled to twice its original resolution. Then, I composited in a detailed image of the M105/NGC3389/NGC3384 group which was made from 11 hours of data captured through my C-8 telescope at 1160mm. M96 was similarly composited from 12 hours of C-8 data, and M95 details were added by compositing 2 1/2 hours of data. This method of combining the images allowed me to capture the entire wide field, while bringing in good details for the major component galaxies. In the aggregate, this image represents a total of 29 hours worth of data. In this photo, North is Up. This image is cropped to 39% of the original full frame of the 200mm image. Software Used Images Plus 4.5 and 5.0 for camera control, calibration, stacking, digital development, star shrinking, smoothing and noise reduction, advanced Lucy-Richardson deconvolution, and multiresolution sharpening. Photoshop CS5 used for levels and curves, high pass filter, star shrinking, screen mask invert, lab color, saturation adjustments, selective color, vibrance, match color, and smart sharpen. Gradient Xterminator for gradient removal. Carboni Tools for additional noise reduction, and smoothing. Registar for aligning stacks and composites and for color channel alignment. Focus Magic for focus restoration. Notes While this isn't the most exciting field of view, I like the way the image shows the entire subgroup of galaxies. I was also fairly pleased with how the compositing of the detailed images worked.